The Arcus Foundation, the Council for Global Equality and the Open Society Foundations announced the establishment of the Russia Freedom Fund in November to provide financial support directly to groups working to end discrimination and violence in Russia based on sexual orientation and gender identity. The Fund was created with the support of numerous other human rights advocates in response to the recent and dramatic expansion of discrimination and violence directed at LGBT people in Russia, following anti-propaganda and other legislation passed earlier this year. Learn more about the fund and donate here. The Opening Ceremony of the 2014 Olympic Winter Games in Sochi, Russian Federation will be held on February 7, 2014. The delegation will attend athletic events, meet with U.S. athletes, and attend the Opening Ceremony. The Closing Ceremony of the 2014 Olympic Winter Games in Sochi, Russian Federation will be held on February 23, 2014. The delegation will attend athletic events, meet with U.S. athletes, and attend the Closing Ceremony. Can the strategies that turned the U.S. LGBT movement into a money machine work when the fight goes abroad? 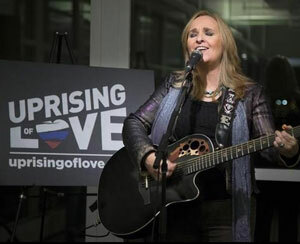 Melissa Etheridge headlined a celebrity fundraiser for a new coalition that hopes to make that true. When Julie Dorf started trying to raise money for international LGBT rights work more than two decades ago, she said, people looked at her like she was nuts. And while U.S. support for LGBT advocacy abroad has grown over the years since IGLHRC came into being as the first international gay rights organization in 1990, it has claimed a tiny sliver of the dollars going to LGBT advocacy. Major grassroots fundraising efforts with the celebrity glitter that the domestic movement became so adept at were not a part of the equation. But a fundraiser headlined by Melissa Etheridge on Monday night in Manhattan showed how much times have changed. Etheridge has partnered with Dustin Lance Black and other entertainment industry figures to form a coalition to raise funds for Russian LGBT activists, which they’re calling Uprising of Love. That’s also the title of the anthem Etheridge penned for the movement resisting Russia’s “homosexual propaganda” law. It will go on sale in January with proceeds going to LGBT activists. By the time the Uprising of Love coalition launched, the Human Rights Campaign had already made waves by diving into international work with a $3 million investment from Republican financiers. Its first initiative was also a fundraising campaign for Russian activists, under the banner “Love Conquers Hate.” It uses the classic retail strategy that HRC perfected to support its domestic work: selling campaign-branded t-shirts advertised with photos of celebrities in campaign gear. In remarks before performing the new song, Etheridge gave voice to the mood among Americans that seem to make them ready for international LGBT fundraising pitches.